Library Portraits - YARMOUTH PORT LIBRARY... WHERE YOU FIND MORE THAN JUST BOOKS FOR READERS YOUNG AND OLD! 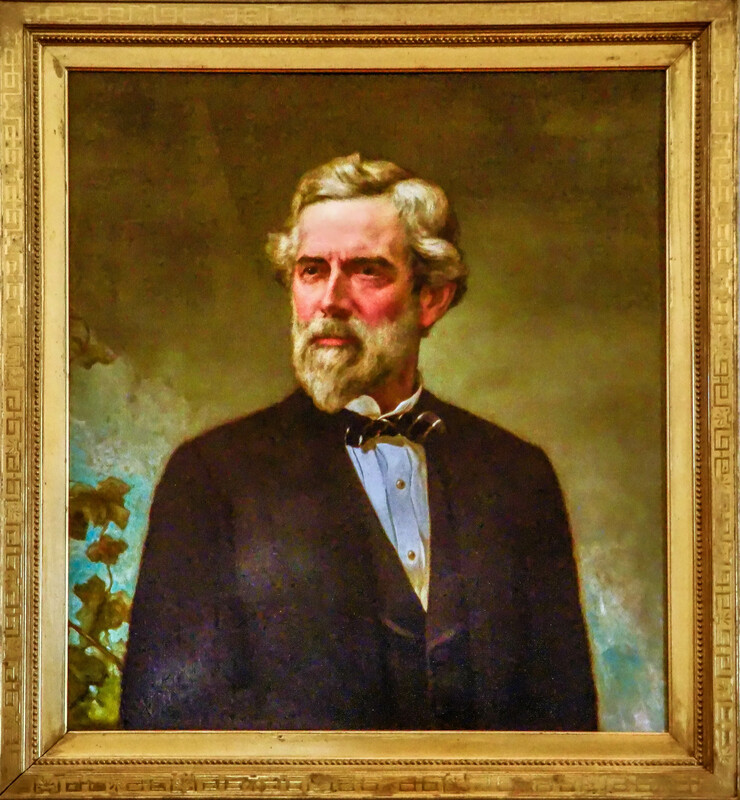 We hope that you have noticed the portraits of 19th Century community leaders active in the formation of the Yarmouth Port Library that hang in the Library. Following are brief biographical sketches of these community leaders for your enjoyment and enlightenment. All the portraits are oil on canvas. At this time the authors of the portraits are unknown except for the painting of Rev. Cogswell, painted by F. S. Perkins. The Library continues to investigate the authorship and documentation of the gifts to the Library of these portraits. If you have any information that would be of interest on this subject, please contact the Library. This article is based on research done by Donald Knaub who can be reached at donaldknaub@comcast.net. The photographs are the work of several members of the Dennis Yarmouth Newcomers Nature Photography Group. The Yarmouth Port Library is very grateful for their contribution. 1. Portrait of James Matthews. Captain Matthews was born 12 June, 1779 and died on 15 December 1858 in Yarmouth Port, MA. He was married to Sally Hallett (1784-1822) from another prominent Yarmouth Port family. James is the fifth generation of Matthews in Yarmouth Port; the first was James Matthews born in Gloucestershire, England and moved to Yarmouth Port in 1684. Following is from the website ancestry.com. 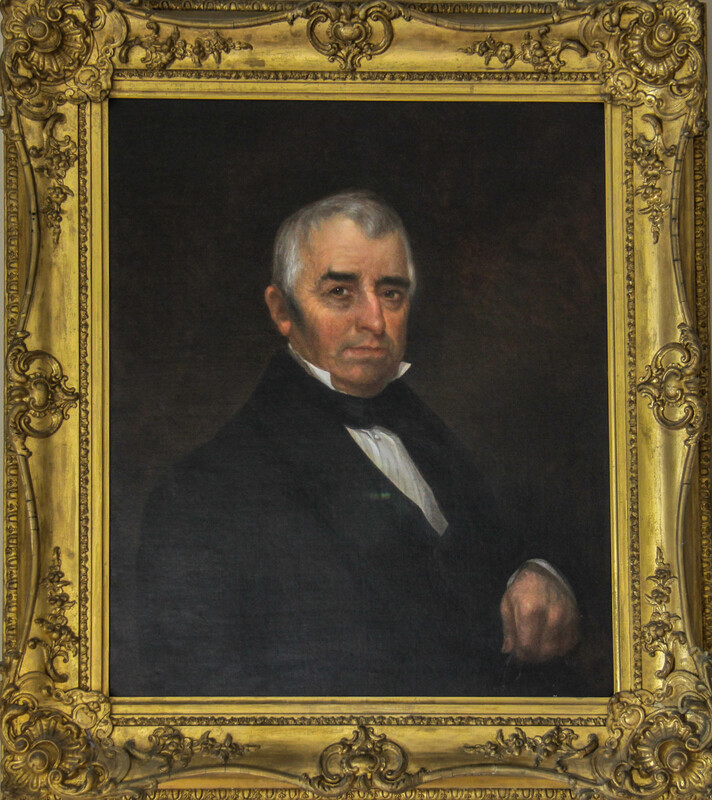 Nathan Matthews funded the library building in honor of his father and gave this portrait to the library to acknowledge this dedication. 2. Nathan Matthews was born on 15 September 1814, and died on 29 August 1904. He was married to Albertina Bunker (1828-1922). Between 1860 and 1870 Nathan Matthews was the President of Boston Water Power Company. In this position he developed Boston’s Back Bay area which was mostly under water (all streets from Arlington west). Although Nathan Matthews was originally cited in Library material as Mayor of Boston, it was Nathan Matthew’s son, Nathan Matthews Jr. (1854-1927) who was Mayor of Boston from 1891 to 1894. In December, 1870, Nathan Matthews, a native of Yarmouth Port, erected a handsome building for the Library, costing about six thousand dollars, and he announced that the interest on an additional five thousand dollars would be placed at the disposal of the trustees. The Library Association was then reorganized in response to this generous gift, and as a result something like four thousand volumes, many of them books of permanent value, were placed upon the library shelves. Another example of Nathan Matthews’ philanthropy is Matthews Hall, on the campus of Harvard University. The residence hall was completed in 1872 at a cost of about $113,000 and Matthews stipulated that half of the net income from the dormitory should be used to aid needy students. Fifteen Matthews Scholarships were thus established. 3 & 4. 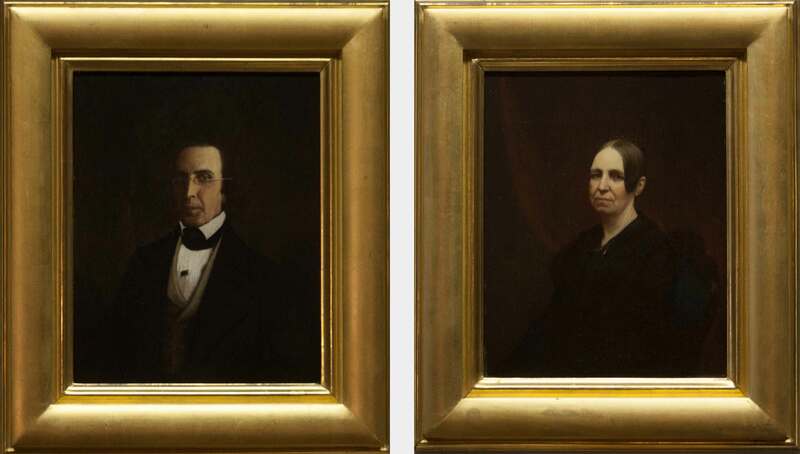 We have companion portraits of George Hallet (1784 -1844) and Elizabeth Gordon Hallet (1781-1863). The Hallets were married in 1806 in Boston, MA. Elizabeth Gordon Hallet was the mother of 13 children. Around 1818 the family lived in Yarmouth Port at a home located where today the Cape Cod Cooperative Bank and Bank of America are located. On July 14, 1950 The Trustees of the Library Association formally accepted two oil paintings, gifts of Mr. Frederick W. Andros. George Hallet and Elizabeth Gordon Hallet were grandparents of Mr. Andros' wife, Mrs. Alice Hallet Andros. The final two portraits were influential clergy of the First Congregational Church in Yarmouth Port and active in the early growth and leadership of the Yarmouth Port Library. Dr. Eldridge, a Yale graduate, was granted an honorary Doctor of Divinity from Hamilton College in 1863.After his death in 1888, the President and Fellows of Yale University acknowledged the bequest from Dr. Eldridge of a collection of shells, ten thousand specimens including many fine examples not before represented in the Museum of the University. The much traveled, Dr. Eldridge finally settled in Yarmouth, Massachusetts. He was Minister at the First Congregational Church, Yarmouth Port and President of the Yarmouth Library Association when it was referred to as The Yarmouth Free Library. He selected books for the new library and generously gave for their purchase. Dr. Eldridge served as Pastor of North Congregational Church from 1847 to 1856. Dr. Eldridge was President of the Barnstable County Agricultural Society from which he resigned 1888. In this capacity he is known for the development of the first cranberry bog on Cape Cod. He was also the first President of Yarmouth Port Improvement Society. The present Hoak and Hastings organ at First Church was donated in 1892 in his honor by his widow. January 5, 1876, Dr. Eldridge joined the Library Board and was elected Vice President of Library Trustees for the 1881-1882 term and then later served as their President. 6. Portrait of Rev. Nathaniel Cogswell. Dr. Cogswell was born March 5th, 1796 and died March 25th, 1874. He was married to Susan Doane, who was born in 1799 and died in 1852. 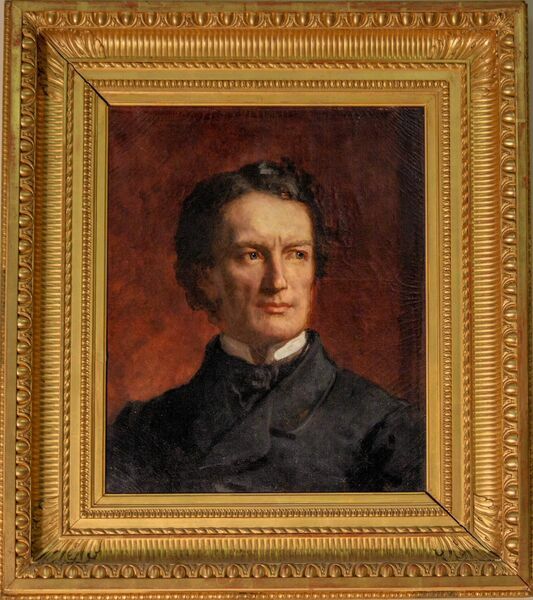 This portrait, given to the Library in 1906 by Cogswell’s granddaughter, Mary Trumbull Cogswell, was painted in 1867 in Milwaukee, Wisconsin by Frederick Staunton Perkins (1832-1899). 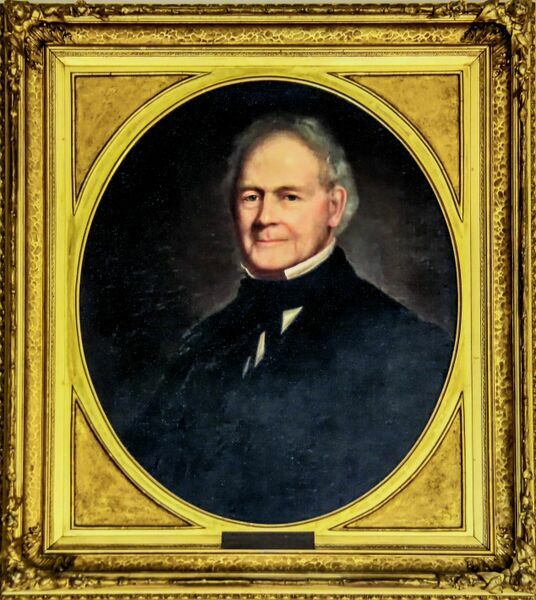 Dr. Cogswell was a New Hampshire native, an 1819 Dartmouth College graduate and minister of the First Congregational Church in Yarmouth Port from 1822 to 1851. He offered his former law office which was near 83 Main Street in Yarmouth Port to be used as a library. The building was then moved in 1866 to the Library's present location, when Henry C. Thatcher gifted the land on which the library now stands. Local citizens graded the land and assisted with the move. At the dedication of the new library building, erected in 1870-71, Nathan Matthews presented the library keys to Dr. Cogswell, President of the Board of Trustees.